This is a guest review of Rome by Jeremy Davis from GameGeek.Ninja. So, sometimes when you get a lot of games in the mail, you forget what it was you ordered, or what someone is sending you to review. That was kind of the case when Cheeky Monkey arrived. I had not expected it that day. What I had expected even less was the package that arrived. You see, I had expected to find a game in a box; instead I found a game IN a monkey. 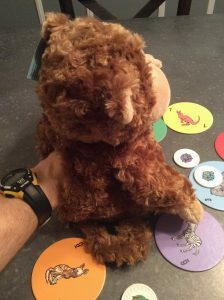 with different animal stickers on them and end-game bonus tiles showing the number of each animal included) packed inside a plush monkey bag. Basically, at its heart, Cheeky Monkey is a “press your luck” and “set collection” game. 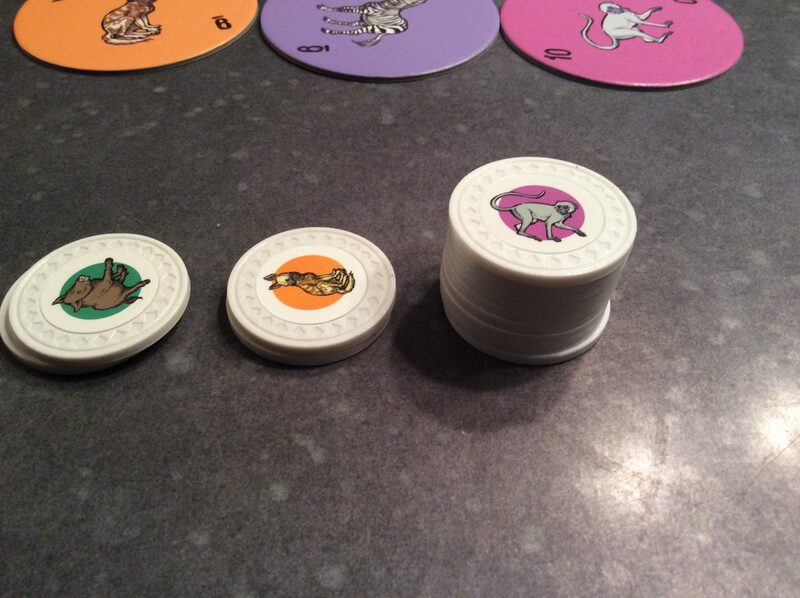 To setup the game, you place all of the animal tokens in the Monkey, which will act as a draw bag. 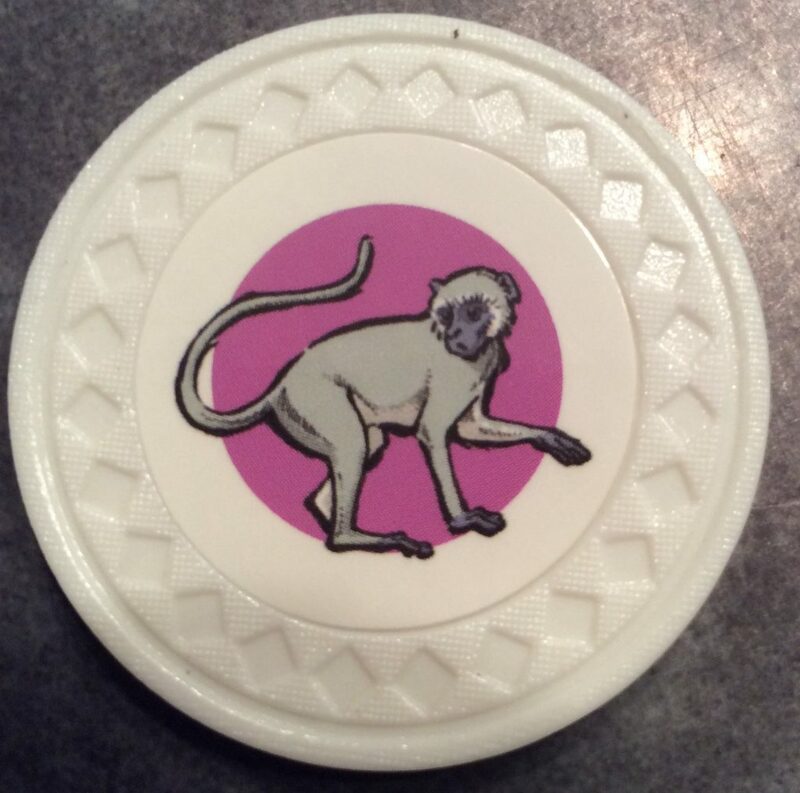 On your turn, you draw a random token from the monkey bag – let’s say you got an Elephant. You now take all Elephants showing on the top of your opponents’ stacks. If after taking the top Elephant token off of your opponent’s stack another one is revealed, you take that one too. After all the Elephants on the tops of stacks are taken, you may end your turn or continue your turn. If you continue, you draw another animal token from the bag. If it is a different animal, say a Hyena (anything other than an Elephant) you collect any Hyenas off the top of your opponents’ stacks – just like the Elephants. You then make your choice again, continue or end your turn. You may keep pressing your luck in this manner as long as you want or until you select an animal from the bag that is the same as any already drawn this turn (Elephant or Hyena). If you draw the same animal as before, you lose all of the animals collected this turn and they go back in the bag. 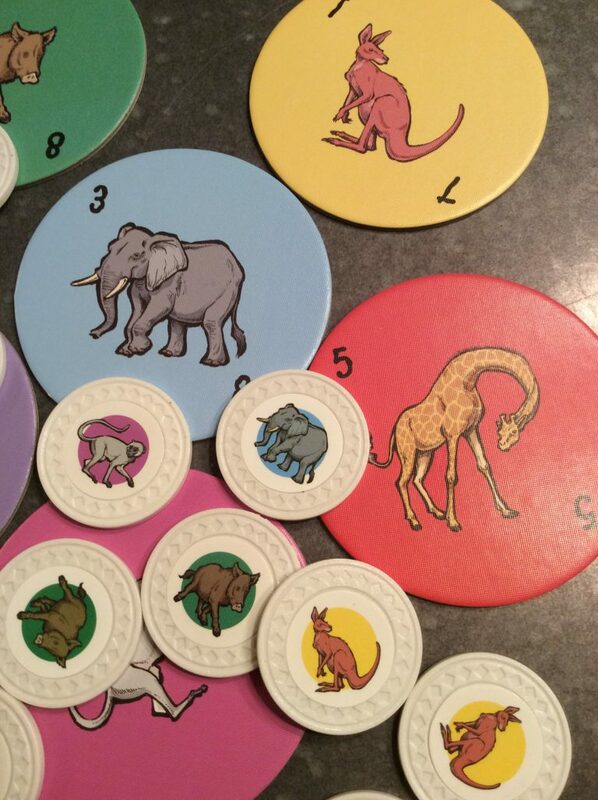 If you choose to end your turn before drawing a duplicate token, you get to keep all of the Elephants and any other animals collected and place them on top of your stack in any order. You may not rearrange any that were in your stack before you turn started. If you only collected one type of animal, you may place them on the bottom of your stack. The only other rule is for the monkey tokens. If you draw a monkey, you can proceed as normal – claiming any monkeys from the top of opponents’ stacks – or you can take the monkey and swap it for the top token on the top of someone’s stack. This allows you to collect these monkey tokens at a later time if you draw another monkey. The game ends when the last chip has been collected from the bag, and added to stacks. Each player then counts up their animals. If you have more Elephants than any of your opponents, you get the bonus Elephant tile, and so on with each of the 8 animal types. Then everyone totals up their score. Each token is worth 1 point plus the bonus points listed on the bonus tiles that were awarded. The player with the most points is the winner. The gameplay of Cheeky Monkey is pretty straightforward. It’s a set-collection game with a strong “push your luck” aspect, emphasis on luck. It is simple enough so that you can play it with children, but it is not necessarily just a kids’ game, even though the packaging certainly points it in that direction. There are a number of elements that add a level of strategy to the game, but it does rely heavily on luck. On your turn, you choose how far to push your luck. You can stop after your first draw from the bag each turn, but you may find yourself falling behind in the token count. Striking a balance between when to continue and when to end your turn is what the game is all about – that is, if you are really that concerned about winning. In reality, the game plays just as well if you are not really trying that hard to formulate a strategy. Personally I think the fact that the game is designed so that it can be easily adapted to work with kids is what gives it this light, fun feel. You can easily take your turn, claim a bunch of tokens, draw a duplicate token and lose them, all without really putting too much thought into it. Because of this, you never get too caught up in the positives or negatives of a given turn, which I think is one of its strengths. 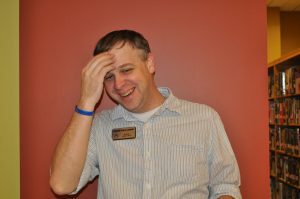 Mostly, I really only have a few problems with the game, and all of them lie with the components. First off, the monkey. It really is a cute monkey, but it has no legs! I’m sure the package was designed this way so that it would sit well on a retail shelf and stand up well on the table as you play , but it is a little disconcerting. Also the animal tokens sometimes get wedged in the insides of the monkey, but again, that is a minor inconvenience. But the monkey is only a personal quibble, and is at least on theme. My real problem is with the animal tokens. Basically, they are plain white poker chips that you affix stickers to when you are initially setting up the game. These could have been much, much better. I didn’t really mind having to put the stickers on myself, but it would’ve been better to have something a little nicer for tokens. As it is, they just look and feel cheap. As with anything, it is important that a game company knows its audience when creating and marketing a game, and with Cheeky Monkey they have done just that. This is not a game for serious gamers looking for deep strategy and intense gameplay. While it has a little strategy built in, it is mostly designed as a light, fun family game that you play in very casual settings, and in that, it is designed rather well. 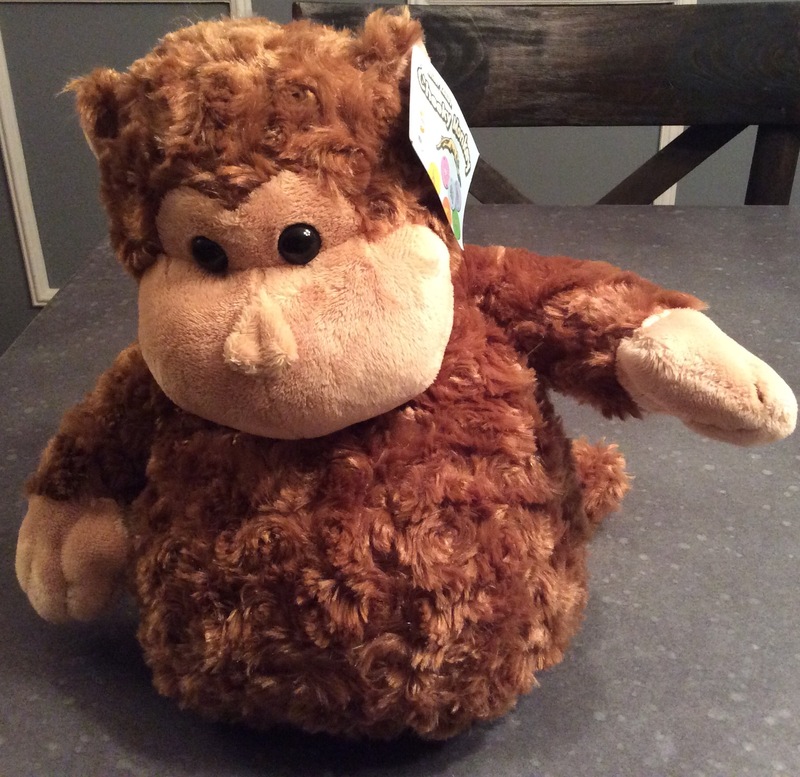 So as long as you don’t mind looking a little silly with your hand inside a stuffed monkey for half the game, pull up a chair because you might just enjoy Cheeky Monkey. Eagle-Gryphon games provided us with a copy of the game for review purposes – no other compensation was provided.